The pop-punk band’s new album is out now. feels like the first time. it feels like the very first time. 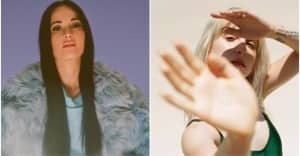 Ahead of the release of their After Laughter album, which is out today, Paramore performed songs from the record during a performance in their hometown of Nashville on Wednesday night. During the show, the band busted performed album single "Hard Times" live for the first time and busted out a high-energy cover of The Strokes's 2001 hit "Someday." Paramore will perform another date in Nashville on Friday, and is set to appear on Jimmy Kimmel Live! next week, before heading out on their European tour in June. The band has also announced their third Parahoy! Festival, a concert cruise that sets sail from Miami on April 6, 2018. Listen to Paramore's After Laughter album here and watch clips from their Nashville performance below. @paramore performing 'Hard Times' for the first time!